On the run from the Arkinnean militia, Jedi Masters K’Kruhk and Zao must protect the younglings from being murdered in issue #4 of Dark Times: Fire Carrier. Running through the forests, the pursuers will stop at nothing to get the job done. With K’Kruhk diverting attention away from the group, Zao and the younglings have a chance. But what will happen when they run into the strange, ape like creatures depicted on the cover? Friend or foe, this issue packs in some great action and wonderful artwork. I have to give points to Gabriel Guzman for his depictions of the militia. So often we see armor designs borrowed from stormtroopers, clone troopers, the royal guards or the Mandalorians. Whenever a new design pops up, it’s nice to see. There’s quite a bit of the militia in action in this issue, and Guzman does a good job illustrating them. Whether they’re blasting away at the Jedi or on patrol, they’re always depicted with a nice level of detail. The story in this issue covers some interesting elements. Master Zao has to deal with one of the younglings struggling with the dark side. K’Kruhk dukes it out with militia in the forest. Then there’s the arrival of the ape creatures pictured on the cover. Though they look a bit more trollish in the interior art. They are very similar to the Ewok eating Gorax who live on Endor, only a lot smaller. Regardless, the issue ends on a cliffhanger, so we’ll have to wait and see what happens with them. The focus was pretty tight in this issue, with only one page showing events offworld. 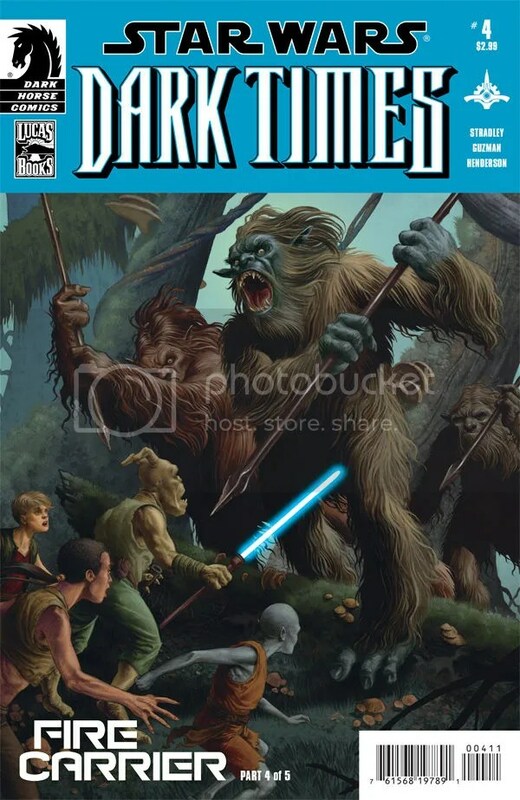 The rest of the story depicted the tense hunt for the Jedi in the woods. In doing so, there’s a lot of action and drama. It works well in the issue, and also as part of the overarching story. Both K’Kruhk and Zao get some attention as they deal with the problems forced upon them. The story does a good job of further developing their characters. This is a nice issue to look at, too. I really liked the artwork overall. Guzman and Henderson did a great job of depicting the woods that dominate all the panels. Greens, browns and blues dominate the color palette, submerging readers into the canopy of the forest, or plunging them over waterfalls. There’s some great scenes of K’Kruhk stalking the militia in the forest. However, the highlight for me was the waterfall battle. K’Kruhk engages a militia trooper in close quarters combat. The panels perfectly capture both the action and emotion of the scenes. It’s interesting how just the presence of the water can add so much to the atmosphere. It clings to the characters as they walk through it. It engulfs them as they float in it. As subtle as it is, it’s amazing how that little addition to the artwork can bond everything together and make it work so well. The visual storytelling perfectly compliments the written story. I’d have to say this is my favorite issue yet, artwise, in Fire Carrier. With great artwork and storytelling, I give a Dark Times: Fire Carrier #4 a well deserved five out of five metal bikinis. The dialog and the artwork are clicking together perfectly as the story progresses. With only one more issue to go, I can’t wait to see how it all ends.